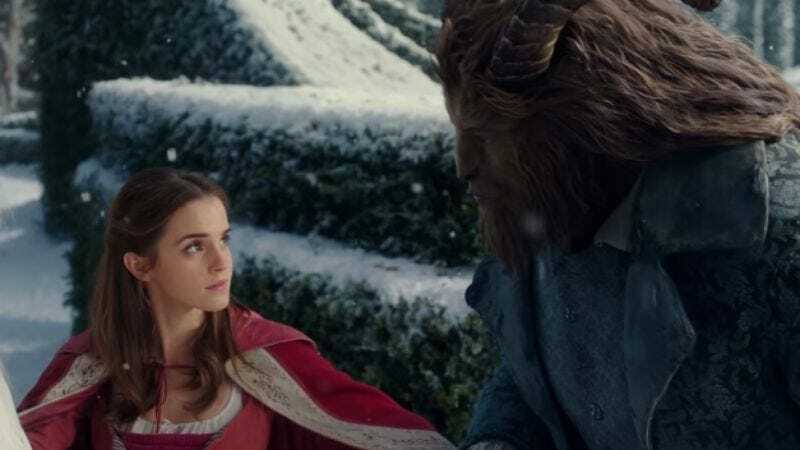 Emma Watson has reassured fans of Disney’s Beauty And The Beast—and its live-action remake, in which she stars—that the feisty Belle’s eventual love for the Beast is genuine, and not the result of Stockholm Syndrome. The idea that Belle and Beast’s romance is less about adorable snowball fights and heroic wolf battles and more about him keeping her locked up in his giant house until her desire to placate her captor warps into a deranged form of affection is a popular one with fans, who have frequently pointed out that kidnapper/kidnapee isn’t the most awesome look, happily ever after-wise. And while that doesn’t directly address the inherent power balance between the two characters—one that can pretty easily color perceptions of their burgeoning friendship and perfectly choreographed love—Watson also noted that Belle refuses to act like a prisoner, despite her situation. “In fact, she gives as good as she gets. He bangs on the door, she bangs back. There’s this defiance that ‘You think I’m going to come and eat dinner with you and I’m your prisoner—absolutely not.’” Beauty And The Beast arrives in theaters on March 17, allowing America’s armchair psychologists to judge Belle’s mental state for themselves.